Few post-Victorian poets can have had their work appreciated so warmly as Walter de la Mare (1873-1956). His work includes not only a substantial body of poetry both for adults and children, but anthologies, novels, and short stories of particular distinction. In all his writing can be found his characteristic attributes of nostalgia, enigma, sensitivity to experience outside the normal, delicate and assured craftmanship, gentleness, appreciation of place, of nature, of mood and, if sometimes a little sadly or sardonically even, of people. His father was of Huguenot descent but died when his son was four. The poet was born in Charlton; became a chorister at St Paul's Cathedral, then worked for the Anglo-American Oil Company before resigning in 1908 to become a full-time writer. 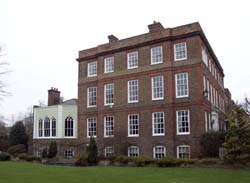 He became a tenant of the Sedgwicks at Southend House, Montpelier Row, overlooking Marble Hill Park and the Thames, in about 1940, though during the war he spent much of his time at the Old Park, Penn, Buckinghamshire. It was at South End House, however, that he left his windows uncurtained and had a policeman row across the river to rebuke him; where he kept his collection of antiques and books on crime; where he watched the river and people passing in the Park, and where he received friends such as Joyce Grenfell, Leonard Clark, Richard Church and many another with whom he partook liberally of tea and conversation. He died there on 22 June, 1956. The English Heritage Plaque at Southend House. A list of de la Mare's books would be a long one, ranging as it does from The Listeners and other poems (1912); Motley (1918); Poems 1901 to 1918 in two volumes (1920), and Peacock Pie (1915) to Winged Chariot (1951) and 0 Lovely England (1953). In 1963 W H Auden made a very fine selection of the poetry entitled A Choice of de la Mare's verse. The Return, a haunting novel of 1910, deserves reissue. Thanks to the editorial devotion of Giles de la Mare the adult short stories are now available in two magnificent volumes, covering 1895-1926 and 1927-1956 stories, respectively, and it is only since their issue in 1996 and 2001 that this aspect of de 1a Mare's work can be properly appreciated. Recent years have seen the formation of The Walter de la Mare Society and, in January 1998, the commencement of the Society's magazine. 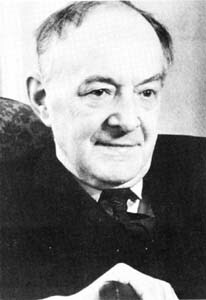 De la Mare was made a Companion of Honour in 1948 and received the Order of Merit in 1953. He is buried in St Paul's Cathedral.